WAKEFIELD, R.I.—Making the right design decisions early in development can have a substantial impact on total product cost. And because companies get few second chances in today’s global markets, it’s critical that they choose the right structures, materials, processes, and labor for their product development and manufacturing projects. Presenters at the 2016 International Forum on Design for Manufacture and Assembly (DFMA®) will discuss these and other imperatives—including the improved reliability and time-to-market that can be achieved with DFMA—at the thirty-first annual forum on June 7-8, 2016, at the Crowne Plaza Hotel Providence-Warwick, in Warwick, Rhode Island. The theme of this year’s conference, hosted by Boothroyd Dewhurst Inc., is “DFMA Design Decision: Understanding Total Product Cost.” Boothroyd Dewhurst, Inc. is reported to be the first company to commercialize Design for Manufacture and Assembly (DFMA®) methodologies and software—tools that make it possible, through product simplification, to evaluate, estimate, and reduce the manufacturing cost of a product in the design phase. Speakers will include representatives from Boeing, Medtronic, Kohler, Dynisco, and Woodward. 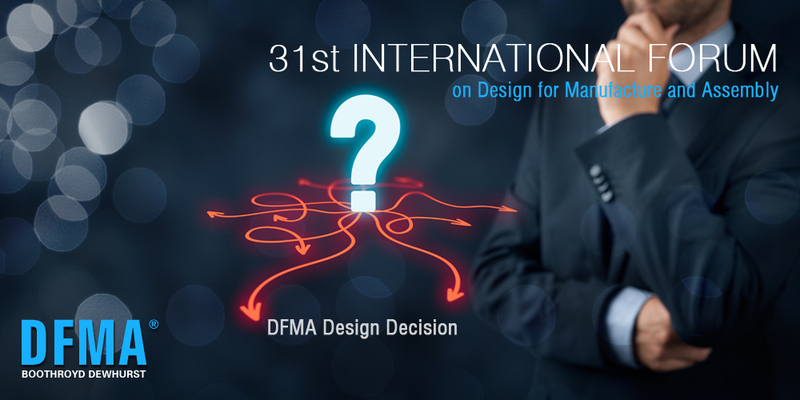 Nick Dewhurst, executive vice president of Boothroyd Dewhurst, Inc., together with David Meeker and Chris Tsai, will focus on the “DFMA Design Decision” theme of this year’s conference. Design for Manufacture and Assembly helps structure a team’s knowledge and guide collaboration efforts from the concept stage onward to create feature-rich products at less cost. It does so by providing comparative “should cost” estimates for manufacturing processes and materials, and by targeting opportunities for product simplification. The Forum offers insights and solutions to managers, financial decision-makers, design engineers, manufacturing engineers, purchasing personnel, and supply-chain experts interested in benefitting from up-front product development. For more information on the 2016 International DFMA Forum on Design for Manufacture and Assembly, and the pre-conference workshop, go to www.dfma.com/forum/index.html. DFMA is a registered trademark of Boothroyd Dewhurst, Inc.